Angry, frightened, sorrowful, yet filled with caring and compassion, this collection of deeply personal and powerful essays ponders how the AIDS epidemic has changed life for gay men, especially those in New York City. I thought that 23 years after my friend Mark’s death from AIDS I would finally be able to read a book about the disease and those who perished without shedding a tear. It turns out I was wrong. As Anthony Rapp says in his brilliant memoir, Without You, “Grief does not expire like a candle or the beacon on a lighthouse. It simply changes temperature.” My tears didn’t flow like they did in those late days of Mark’s illness and subsequent stay in a hospice. The place was so homey and comforting, decorated with artwork and handcrafts, each room private, the staff and volunteers warm and caring, that for just a moment I was able to forget it was a place where men went to die. They just hung there in the corners of my eyelids, refusing to drop. This is a collection 23 essays written during the height of the AIDS epidemic, also referred to as a plague. 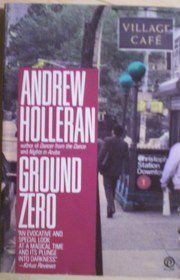 Holleran did a superb job portraying the fear and anxiety of the times and I enjoyed the vivid descriptions of New York and its colorful, gay inhabitants. He writes of the importance of friendships, the joy and freedom that comes with loving who you chose, the destruction of lives, the desperate search for cures, the grief of survivors, and the changes within the gay community. Though Holleran is eminently quotable, I found his writing style lush and rambly at times. The long sentences and descriptive passages definitely suited these stories, however. They felt intimate, personal, poignant, and suffused with love for what was and hope for a brighter future. “And because, most curious of all, most odd, most marvelous, the truth is none of them is really chilled by the assertion – each of them thinks he will escape, I suspect. As Freud also said, “No one really believes in his own death.”"
There were two essays about literary authors I have not read that felt out of place in this book (Henry James and Santayana), and were quite frankly, a little long and boring. The other essays are a treasure and grim reminder that we must carry on and enjoy what life has to offer.